Of all the recently pregnant celebrities out there, I don't think that anyone has pulled it off better than Kristin Cavallari. She looks amazing pregnant, even on her third baby! I have enjoyed being pregnant around the same time as her, because I love seeing what she's wearing and how she's styling her baby bump. 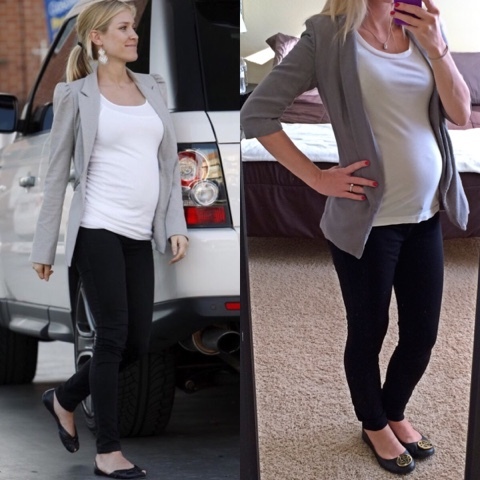 For this post, I went through and pulled a few of my favorite looks that Kristin Cavallari has worn during her 3 pregnancy's and then I recreated the looks by using my own clothes from my closet. Here is what I came up with. Here is one of Kristin Cavallari's instagram pictures showing off her little baby bump. I thought this was a great look for fall. I love the denim and the striped tops together. I wore a striped long tank top from H&M (exact), a denim button down from Target (similar), black leggings (similar) with a pair of brown riding boots (similar). I love this look that she wore while traveling through the airport. It's such a great travel look while pregnant. I love the black leggings and top with the long cardigan. It's such a comfortable and stylish look. (I probably wouldn't be able to pull off this look with the heels in my normal life, but I still tried so that I recreated the look.) I wore black leggings (similar), a black tank top from Forever 21 (similar), a long cardigan sweater from H&M (exact) and ankle boots from Kohl's (similar). I love a cute blazer look. That's why I really love this simple blazer look that she wore. I wore black jeggings from TJ Maxx (similar), a white T-shirt from Target (similar), a grey blazer from Kohl's (similar) and black flats from DSW (exact). Maxi skirts are great during pregnancy, especially in the warmer months. I love how Kristin wore a striped skirt with the denim vest. 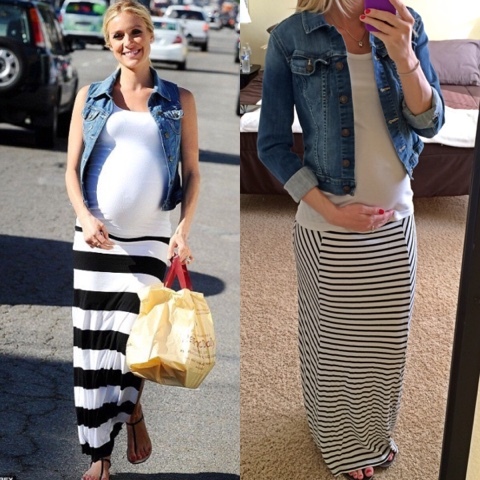 I wore a striped maxi skirt from TJ Maxx (similar), white t-shirt (similar) and a denim jacket (similar). This last look is simple and casual. I love the scarf for when you don't feel like showing off your bump that much. 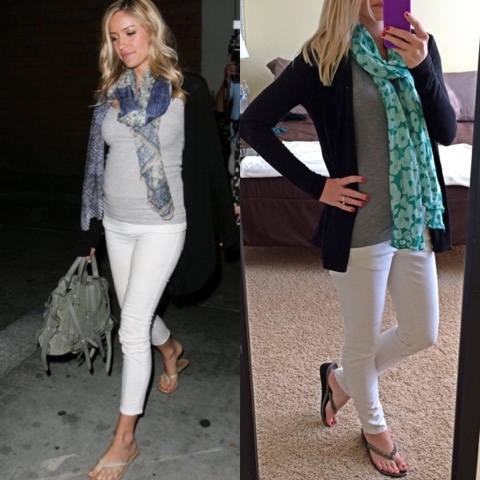 I wore white pants from Target (similar), a grey t-shirt from Target (similar), a black cardigan from Forever 21 (similar), a scarf (similar) and pair of flip flops. 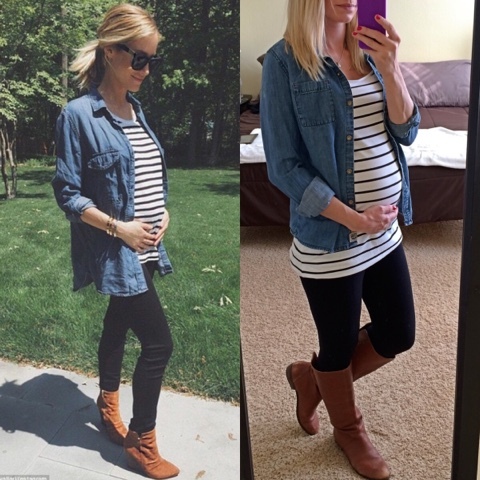 I hope that you enjoyed these recreated Kristin Cavallari maternity looks. What celebrity do you think has the best maternity style?